Use RINGMAT DOMES under loudspeakers, turntables, CD players (also DVD, SACD, and all transports, DACs, etc. ), amplifiers, tuners, video machines, all other items of hi-fi or A/V equipment, and all supporting platforms, shelves etc. directly under speakers and equipment, they should be used with RINGMAT FEET (which include a STATFOOT with every set). When used in conjunction with RINGMAT FEET, DOMES can enable loudspeakers to provide a sound quality that is superior to that using traditional spikes. This concept was first passed to us by the Danish hi-fi manufacturer Holfi, when they were trying the RINGMAT FEET under loudspeakers, but they needed an additional component to fit between the underside of the speaker and the top of the FEET. RINGMAT DOMES were conceived as being the best solution, whereupon it was then established that they outperformed cones and most other forms of isolation point support under all sorts of components and in the support of platforms, shelving systems, etc. 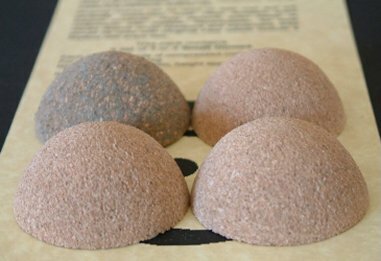 Each DOME is made of compressed cork. It has the shape and appearance of a cone but without a ‘point’ at the top. There are three sizes, Mini, Small and Large, available in sets of 3 or 4. For weights up to 39kg, the Small DOMES have a nominal diameter of 42mm and a height of approx. 19mm. For weights up to 69kg, the Large DOMES have a nominal diameter of 56mm and a height of approx. 25mm. Where a lower profile is required, use the Mini DOMES. These have a nominal diameter of 21mm and a height of approx. 9.5mm. Although noted for weights up to 13kg, in practice we have been using them for much heavier weights, up to 69kg, but with some loss of shape. However, from the sonic point of view, they do not generally provide the same level of sound quality as the Small DOMES when used underneath equipment. Nevertheless, it is difficult to be categorical about which size of Dome produces the best sonic performance. A number of factors can come into play. For example, when used on glass shelves, the large Domes can seem to provide the best sound because they appear to be able to absorb so much more of the ‘ringing’ resonance one otherwise gets when using glass as a support surface. Whilst using three DOMES instead of four may sometimes result in a superior sound quality, such arrangements are less secure. This is a particularly important consideration with regard to loudspeakers. Therefore, when considering whether to use three or four DOMES, bear in mind the increased risk of accident when using three DOMES.